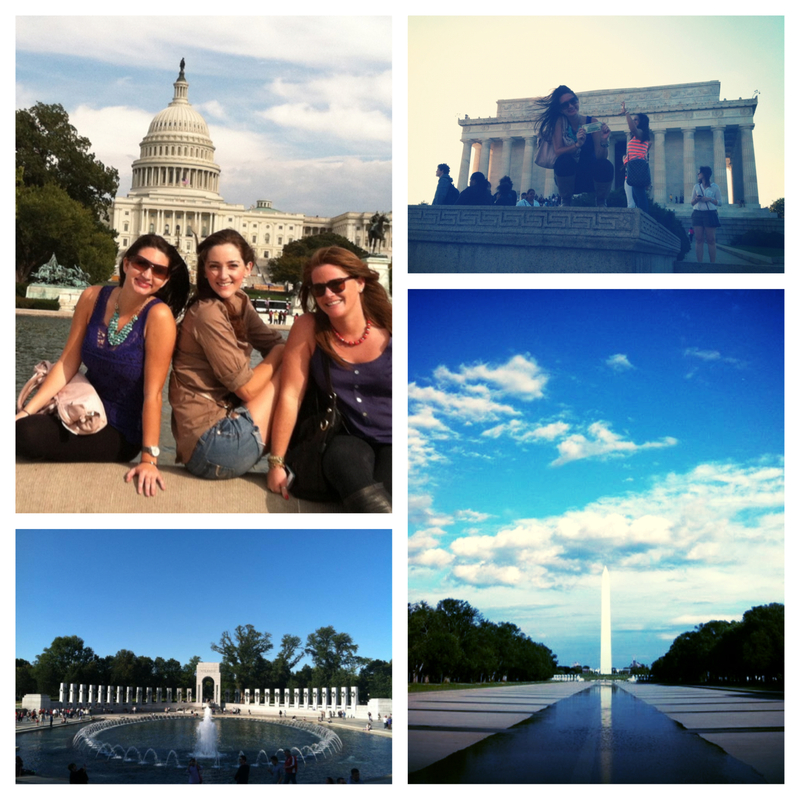 Our contributing blogger, Lisa, explores the United States capital in her three-day excursion. Washington D.C., specifically Georgetown, has captured my heart. Ranking as my favorite city in the United States, I find more things to love about it with each passing visit. While the city offers plenty of culture and historical significance, my post will focus on what we girls do best during getaway weekends: indulging in eating and shopping. It was a Friday afternoon when my friend Angela and I boarded the bus for Washington D.C., leaving New York behind, eager to soak up the weekend and relive our college “glory days.” Angela’s cousin, Emily is a senior at Georgetown, and acted as our tour guide for the entire weekend, introducing me to places I had never been to before. After a night of drinks and catch-up at Tombs, the local neighborhood-favorite bar, we woke up bright and early to begin our weekend. We started each of the three mornings at Saxby’s Coffee. For someone who instinctively turns the coffee pot on within minutes of waking up, Saxby’s Coffee exceeded every cup of coffee I’ve ever had. Upon getting our caffeine-fix, we leisurely made our way down M street, the heart of the city known for its boutiques, cafes and restaurants. 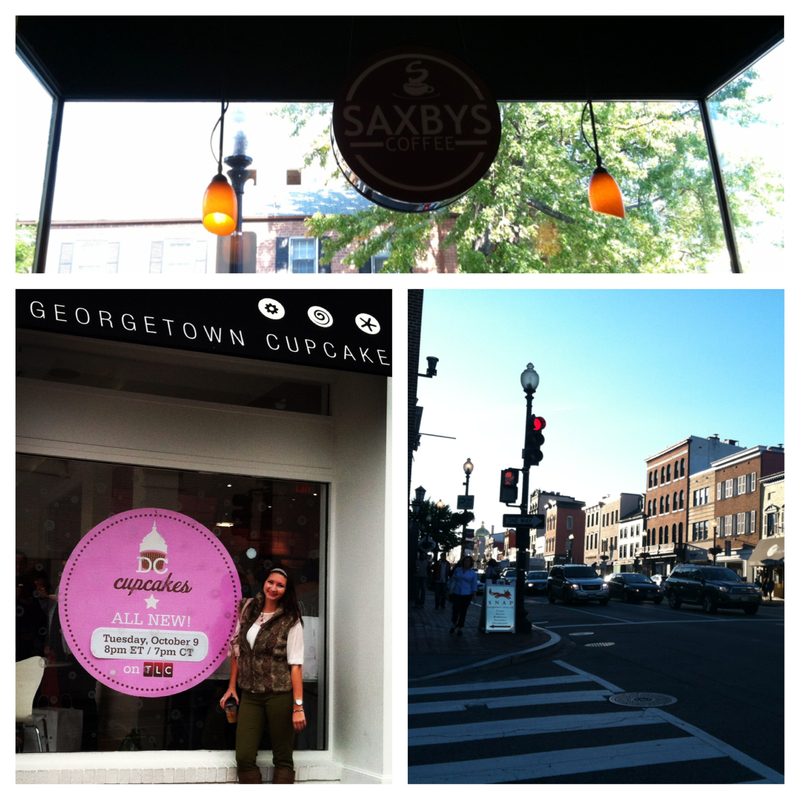 At the top of my to-do list for the weekend was to visit Georgetown Cupcake. Never without a line, Georgetown Cupcake is famous for its long list of delicious cupcake flavors. The bakery was featured during the Spring 2010 season of TLC’s reality show, DC Cupcakes. 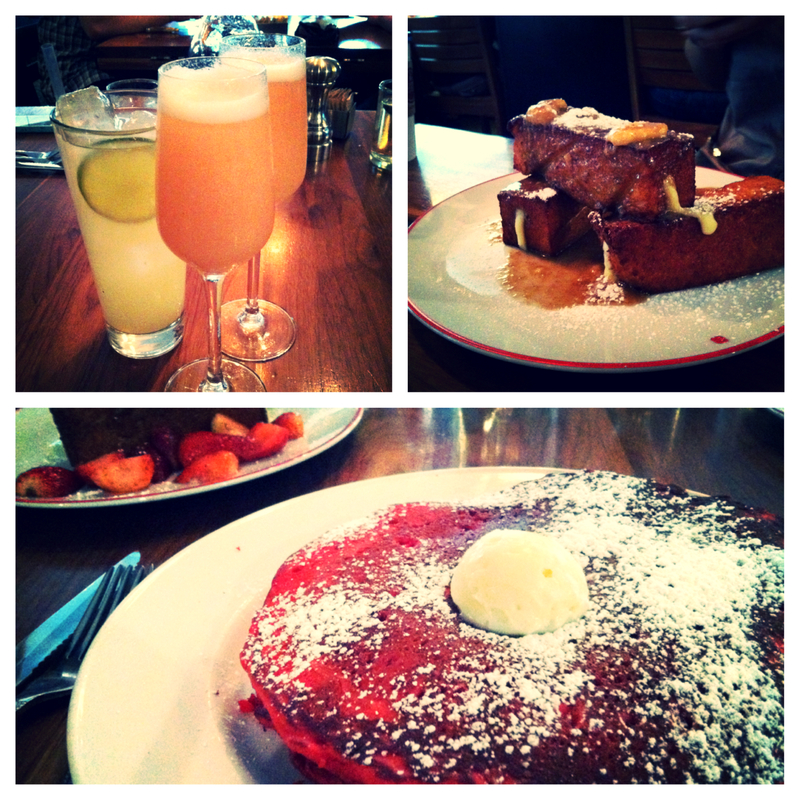 Emily took us to Founding Farmers for brunch. As a lover of all things red velvet, I couldn’t resist the Red Velvet Pancakes. It tasted just like a cupcake but without the heavy frosting. Angela ordered the Stuffed Strawberry French Toast and Emily had the Bananas Foster French Toast, each equally palatable. Served with fruity cocktails, we were very pleased with the quality of the meal, ambiance and service at this restaurant. During my first two visits to Georgetown I stayed within the college boundaries and didn’t explore much of the historical components that make the city such a tourist attraction. However, Saturday’s weather presented us with the perfect opportunity to explore some of the city’s highlights– the Capitol, Washington Monument and the White House. I had never seen these buildings up close before, so naturally the tourist in me came out for some photo-opps, like holding up a five dollar bill in front of the Lincoln Memorial. By the time we got back to campus, there was just enough daylight for Emily to give us a mini tour of the University’s grounds – a campus of buildings built on Collegiate Gothic architecture. We chose the right day for sightseeing because Sunday was a washout – which naturally led to a day of shopping. One of my favorite parts about exploring a new city is visiting the boutiques and local shops. My own personal style has developed from taking bits and pieces from the season’s trends and pairing it with something traditional. Shopping in boutiques feels like a treasure hunt; it’s fun to find clothing and accessories that are unique. When it was time for lunch, Angela’s cousin suggested this little French café on M street. I walked in paying no attention to the name. At our table was a selection of little jars consisting of jams, honeys and creamy spreads. We sampled a few on pieces of bread and I ended up purchasing a souvenir jar for my Mom at the end of our meal. With the recommendation of our waiter, we tried the lemonade, which tasted much like an authentic Southern-styled refreshment. Sandwiches are my favorite lunch dish to order, so I was intrigued by the selection of tartines (an open-faced sandwich). I chose one with mixed greens, artichoke hearts, sweet red peppers, brie cheese and walnuts. You can imagine my surprise when I went back to check the name of this “hidden gem” and realized it was a chain of the restaurant Le Pain Quotidien, one that I’ve coincidentally chosen recently for breakfast meetings this past month. Later that evening, I met up with a friend of mine from high school who now lives in D.C. Knowing how much I love doing all the typical “touristy” things, he insisted on taking me to the P.O.V Rooftop and Lounge, located above the W Hotel. With floor to ceiling windows, the spot is known for having the best views of the city’s historical monuments. The overpriced mojito was definitely worth the phenomenal panorama of the city. To conclude the evening, we made a brief visit to the National Portrait Museum and strolled through D.C.’s Chinatown. We met up with the girls again for dinner at Jaleos, a Spanish-styled restaurant. We split a bunch of tapas, which is a nice way to sample new dishes. We concluded the weekend with wine and began planning what our next city-adventure would be; the perfect ending to an amazing weekend. 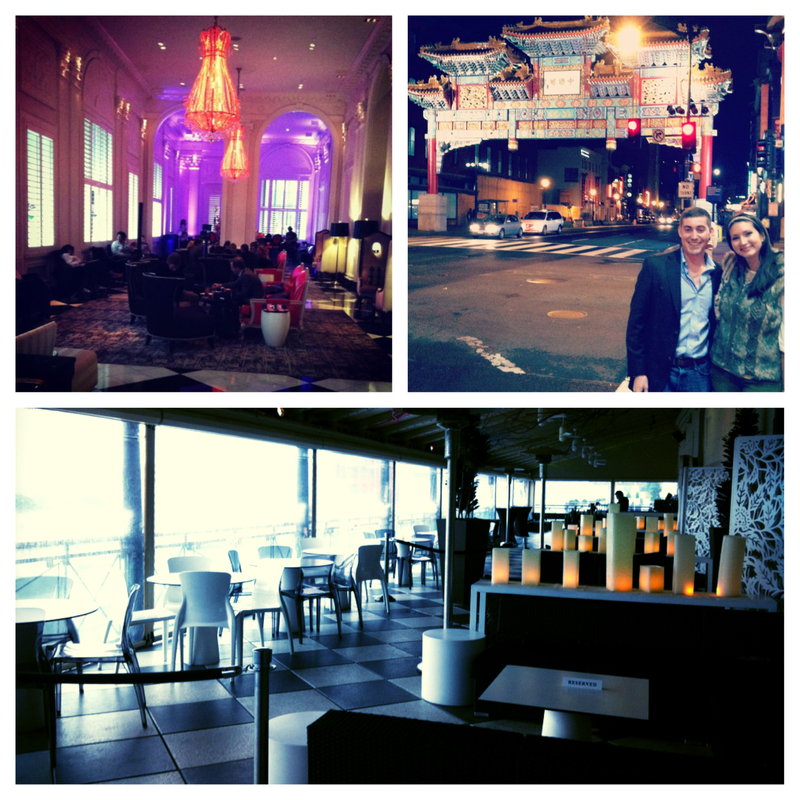 When it comes to Georgetown, one weekend is never enough. I love this post! 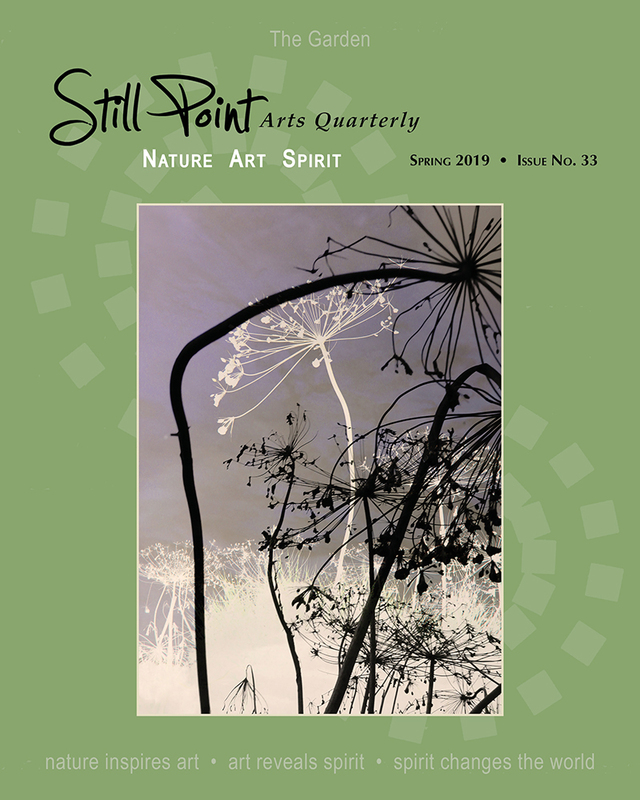 Beautiful photos and interesting text. I enjoyed your virtual tour! Greetings from the beautiful Rhine-Highlands in Germany!